Ammonium is a positively charged ion, NH4, derived from ammonia and found in a wide variety of organic and inorganic compounds. Compounds of ammonium chemically resemble the alkali metals. It is a polyatomic cation, which refers to an electron deficient species that carries a positive charge. The term ‘polyatomic’ refers to compounds that contain two or more different atoms functioning together as a unit. In the case of ammonia, there are four hydrogen atoms bonded to one central nitrogen atom carrying an overall charge of +1. Ammonium is an important source of nitrogen for many plant species, especially those growing on hypoxic soils. However, it is also toxic to most crop species and is rarely applied as a sole nitrogen source. 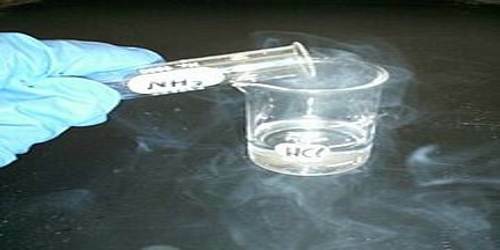 It is formed by the protonation of ammonia (NH3). Ammonium is also a general name for positively charged or protonated substituted amines and quaternary ammonium cations (NR4+), where one or more hydrogen atoms are replaced by organic radical groups (indicated by R). The ammonia molecule has a trigonal pyramidal shape, with nitrogen connected to the three hydrogen atoms. The nitrogen atom has a lone electron pair, which makes ammonia a base. 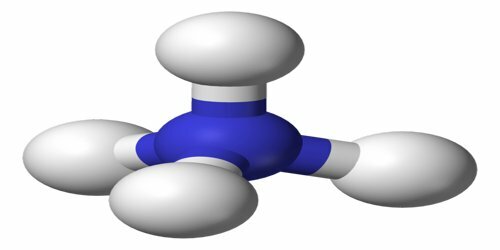 NH3 is a polar molecule which readily forms hydrogen bonds, making it highly miscible with water. It occurs naturally in the body, and is secreted by the kidneys to neutralize excess acid. It is also found in small amounts in rainwater, volcanic areas, and even the atmosphere. 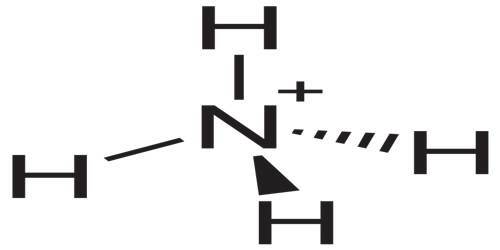 Ammonia is a colorless gas with a sharp, penetrating odor. Its boiling point is -33.35 °C, and its freezing point is -77.7 °C. NH3 gas can be liquefied, however, due to its extremely low boiling point; liquid ammonia must be stored at low temperature and high pressure. It is a weak base. It combines with various acids to form ammonium salts, which are important chemicals in many industries. 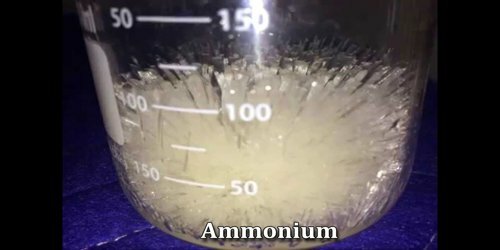 Ammonia readily dissolves in water in an exothermic reaction, to form aqueous ammonia solution, also called as ammonium hydroxide (NH4OH). The ammonium ion has very similar properties to the heavier alkali metals and is often considered a close relative. Ammonium is expected to behave as a metal (NH+4 ions in a sea of electrons) at very high pressures, such as inside gas giant planets such as Uranus and Neptune. Under normal conditions, ammonium does not exist as a pure metal, but does as an amalgam (alloy with mercury). Ammonia is the precursor to various important nitrogen compounds, such as urea, amino acids, phenol, acrylonitrile, hydrogen cyanide, soda ash, nitric acid, and many others. It is also used for the production of fertilizers, polymers, synthetic fibers (nylon, rayon), explosives (TNT, nitroglycerin), cleaning agents, and refrigerants.